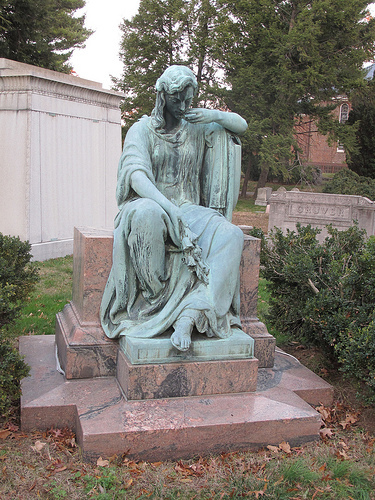 Back in Nov. ’10 we took a week to look at some of the beautiful sculptures at Rock Creek Church Cemetery located at Rock Creek Church Rd and Webster St, NW and near the Old Soldiers Home grounds. It is a great sadness to share with you that our cemetery has been targeted for theft of bronze. At the end of last week an 11 ft bronze work of art and other pieces were removed. This took quite an effort since the installation required a crane and at least six men to get it in place. You can imagine how the family of the deceased feels. We believe that we offer the community a beautiful, quiet spot for walking, running and playing with children. However, we need you to help us. The security mantra of “if you see something say something is a good one.” If you are enjoying our space and see persons defacing the property or acting in a suspicious way please notify our office (202) 726-2080. The Police Department are doing their part. Please help us so we can continue to allow public use of this space. OodlesofJoy Care to share the stir fry recipe? FQotD: How Many Liquor Stores Does One Neighborhood Need?